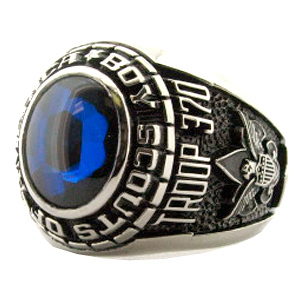 Personalize the 10k white gold Boy Scout Medalist ring with your choice of stone color, side emblems and engravings. The simulated stone is 12mm x 10mm. This ring is officially licensed by the Boy Scouts of America. Enjoy ArtCarved's limited lifetime warranty. Ring top width: 19mm, palm width: 7.2mm. Enter custom wording or 4 digit graduation year. Backdates are available for an additional $20. Accent your year with genuine diamonds. Choose an emblem and the engraving options for that emblem will appear below.